January Workshop - Have I Got News for You!? News articles and newsletters are an extremely effective way to communicate with your customers and also show that your company is fresh, active and engaged. To help you get the very best from your Brick technology experience, we have put together a professional workshop which will focus on optimising your news articles as well as your website content. Creating absorbing, relevant and highly-commu­nicative articles that also improve your website’s rankings (through SEO and backlinks, among other processes) requires input from several areas. By working closely together with our web development team to highlight concrete objectives, you can ensure that every news article provided by our professional copywriter squarely hits its target audience and makes a lasting impression which can be accurately measured and interpreted using our many web analytics tools. The News & Content Workshop will be split into two 1-hour sessions with a break for refreshment in between. Our first session will focus on news and content in general, explaining how it is created and how it can dramatically benefit your company to take a more active role in sharing company developments or changes of objectives and super-objectives with our Brick web development team. We will also look at what makes ‘good’ and ‘bad’ content, explaining the many merits of originality and precision. 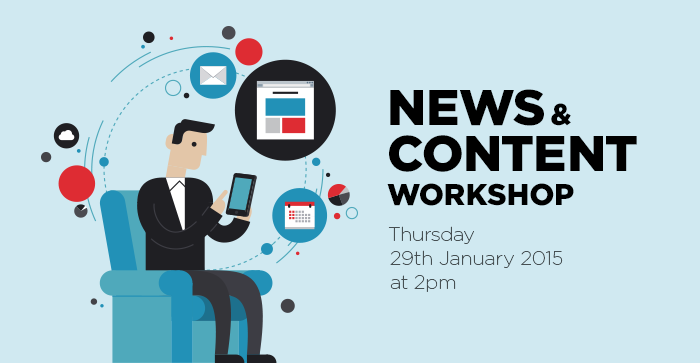 Part Two of our professional News & Content Workshop is designed to give you a better insight into the more practical side of things, showing you how to quickly put together and send out a dynamic, focused and ultimately effective newsletter. This section will also look at building up your list of newsletter subscribers and seeing directly how particular articles or pieces of content are affecting customer decisions. The Brick technology News & Content Workshop will take place on Thursday 29th January 2015 at 2pm and is open to all interested parties. There is no charge for the workshop but places are limited so booking is essential! Call Brick technology now on 01254 277190 to book your place at this essential web development workshop.